In just a few short weeks, yours truly will be fully legal and ready to check out the coolest bars, clubs, and lounges that Los Angeles has to offer (ahh! I'm so excited). Such an occasion calls for some new looks—naturally—and I've found myself thinking about "going out" fashions, or what some may refer to as "club attire". Ugh. I hate the connotations that come along with "club attire". Makes me think of too-tight mini skirts and bad rhinestones. There's a horrible idea that the clothes you wear to go out and party in must be tight and short and revealing, and if that's what makes you comfortable then go for it, girl! But all too often I see people self-consciously tugging at the hem of their skirts or limping in too-high heels (believe me; I live on the fraternity row, and these sights are far too common). No one is telling you that there's a certain way you must dress when you go out. No one will cite you with a ticket from the fashion police if your dress is not black, short, and/or low-cut. It's time we embrace a new kind of going-out dress, one that isn't confined to such narrowing limitations. 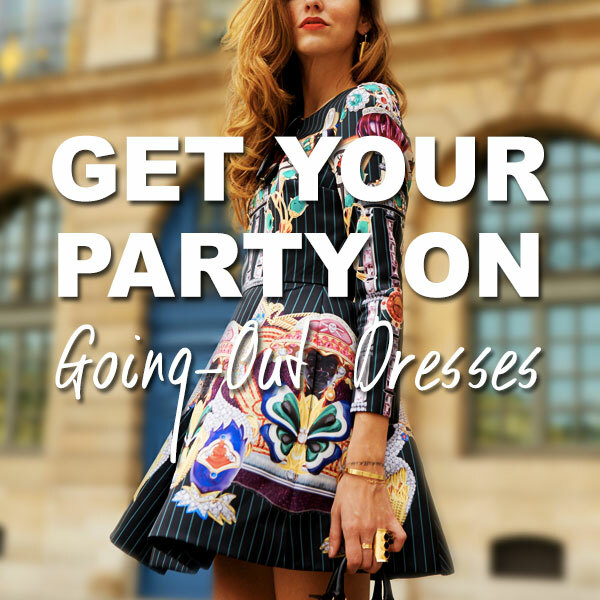 You can wear whatever you want when you hit the town! Just let these top fashion bloggers inspire you! A mini-dress is the number one go-to for any girl looking to hit up 'da club, but don't be afraid to think in color or consider a new shape! Whites and beiges are seldom seen after dusk but you will be glowing in these colors (just be careful of any clumsy drink-holders). If you're looking to add some sparkle to your look, consider dazzling hologram details like Chiara's Versace shift. Or, if sparkles aren't really your style, some well-placed fringe could do the trick rather nicely. Whatever you wear, just be comfortable and confident in it! You are not required to limit your fashion creativity and wear another boring LBD just because Cosmopolitan tells you that that's what men find most appealing. Dress for you and have fun with what you are wearing! You'll be so happy that you did! What style of dress do you like to wear when you go out?